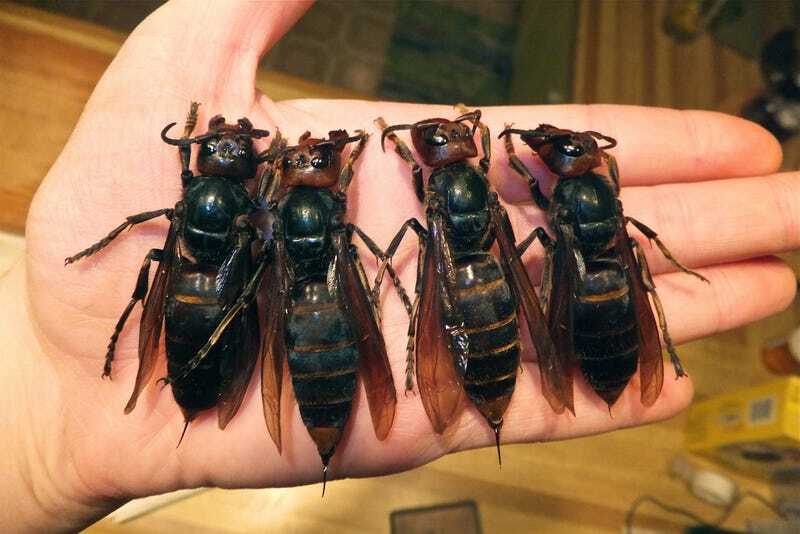 The Japanese giant hornets are Japan’s deadliest animal, and they are not kidding around. They can kill forty honey-bees in a minute, melt flesh by shooting acid at their prey, and cause renal failure in humans. There are few insect stings more painful than the giant hornet’s in the entire world. In Japan, 30-40 people die every year from being stung by one of these. And while we’re talking statistics, that’s a bigger annual average than deaths caused by bears and venomous snakes. Let that sink in. The Japanese giant hornet is a member of the world’s largest hornet family, the Asian giant hornet. Known in Japan as ‘ōsuzumebachi’ which translates literally to ‘giant sparrow bee’, these insects often grow to an astounding size – 4.5 centimetres with wingspans reaching 6 centimetres and more. They are indigenous to the Japanese islands and are as beautiful as they are lethal. Speckled with yellow, brown and deep red, these hornets have three small eyes embedded on their head, right between the two large compound eyes. These ‘hornets from hell’, despite their frightening reputation, are not inherently aggressive. Like every other animal in nature, they only turn vicious when provoked or defending themselves from predators. Survival, y’all. Although they mostly chill in rural villages or areas that are thick with vegetation, they can be found in some urban areas as well. They are are most active in early autumn, during which time the government sends out PSAs to steer clear of these hot-blooded creatures. Interestingly, 1984 was the year when the Japanese giant hornets were particularly pissed with humans, with 73 casualties being reported. The average steadily declined after that, however, and now there is only the occasional case (still too many) of the hiker bearing the brunt of their wrath. The hiking community, in particular, has always had a love-hate relationship with these hornets. There were some instances where climbers were attacked despite coming to them in peace. Colours that are bold – like black and neons, seem to have an attracting effect on these insects, so it is considered wise to dress in lighter shades when hiking in the autumn. Japanese giant hornets are always in the top-three places on Japan’s deadliest animal list. For good reason. Besides their ultra-painful sting, their venom has a median lethal dose (LD50) of 4.0 mg/kg. Tests done on mice confirm that the lethality is not all that much, but considering the sheer amount of venom they shoot in a single go, it is enough to cause some pretty nasty damage. Asian giant hornets, in general, can cause anaphylactic shock in allergic people, but nobody is exempt from the lethality of their sting. 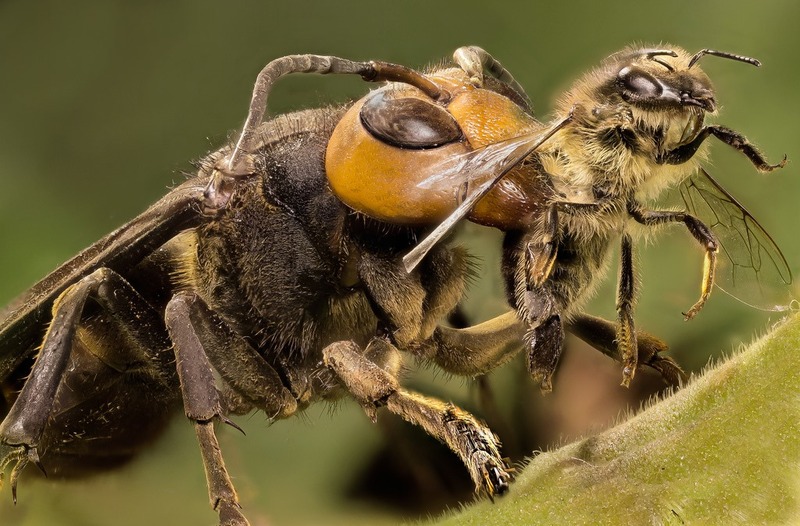 The saliva produced by the giant hornet larvae apparently gives them the stamina to chase their prey – sometimes reaching speeds of 25 mph. Can’t outrun these little hunters. Giant hornets are considered a delicacy in the Japanese countryside. For some people, they are even a regular source of food and most commonly deep fried or served as a Hornet sashimi (yum). Despite being roasted (literally and metaphorically) for being the angry young men of the insect world, these hornets are rapidly declining. This species is listed under those that could potentially reach extinction in the near future, despite their ability to dominate in the natural world. Since their natural environments are being taken away in many ways – deforestation being the primary cause, they have nowhere to go and take up residence in urban spaces. The fact is that these wonderful creatures are dying, and unless we stop taking their homes away from them, there is probably nothing we can do to stop it.